Scottsdale, Ariz.-based cloud CRM Saleslogix has a new owner after New York-based Infor acquired the business unit from Denvor, Col.-based Swiftpage, the firms announced Thursday. The CRM software that was created in 1998 will be given a makeover as a first priority post-acquisition, according to Infor. First of all the new name for the software will be Infor CRM. Secondly, Infor’s New York-based user interface team will be giving the software’s look an overhaul. That’s just part of the investment planned for the new CRM product, Infor states in a press release. It will be integrating it into its CloudSuite platform that assists businesses in deploying cloud software for specific industry verticals – from aerospace to human capital management. No financial terms were released in the deal by Infor or Swiftpage. For its part, Swiftpage says it is going to focus in on catering to the needs of micro- to small-businesses with its other CRM software, Act! Infor is better suited to the medium- to large-enterprise market Saleslogix serves and has the right resources to put behind the software, a Swiftpage press release states. Infor and Saleslogix should prove to be a good fit, according to Ray Wang, principal analyst at Constellation Research. Both firms have a strong customer base in similar verticals including construction, financial services, government, healthcare, manufacturing, retail, and more. Also, Saleslogix already runs on Amazon Web Services (AWS), the cloud platform that Infor’s suite also recently migrated to. “While Swiftpage did a decent job managing the acquisition and improving the product, Infor’s deeper R&D budget, well paired vertical customer base, and mid market to enterprise focus provides a better fit for long term growth. Existing Infor customers should gain a cloud based CRM that will be enhanced and developed with vertical focus and strong integration frameworks through Infor ION. In addition, Infor intends to bring over 105 employees from the Saleslogix team,” Wang writes. 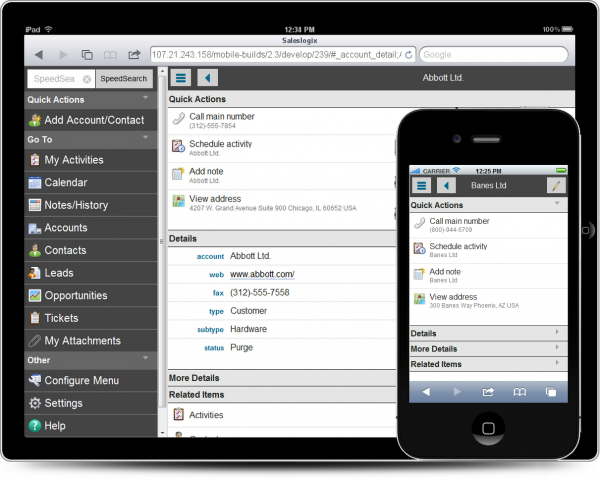 Saleslogix CRM has tools that integrate it into well-used software staples such as Microsoft Outlook. It also has a modern mobile platform that offers social media integration, reporting and analytics, and support for marketing automation. This isn’t the first time Saleslogix has switched hands. It was first acquired by Sage, whom sold it to Swiftpage.